If Trump Won't Advertise Affordable Care Act Sign-Ups, Some States Will : Shots - Health News States aren't getting nearly as much federal money this year to explain and campaign for Affordable Care Act policies. Some are trying to make up the shortfall; others lack the cash or political will. 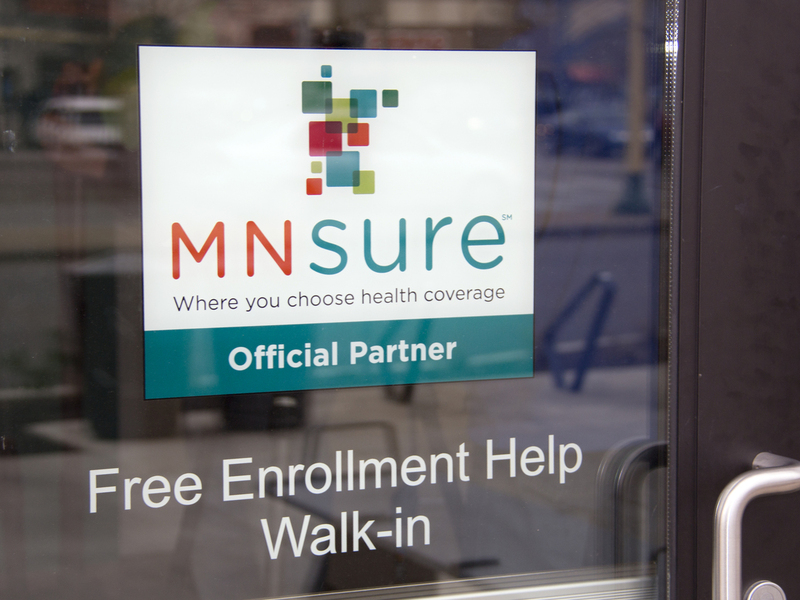 Minnesota's ACA insurance exchange, MNsure, is spending state money this year to hire health care navigators who reach out to consumers to answer questions and help them find the right health plan. If you buy insurance on your own and have been paying attention to the Affordable Care Act, you've probably heard that open enrollment for 2018 plans has just started and the government is spending a lot less money this year to get the word out. That's true in the 39 states that rely on HealthCare.gov. But circumstances are different in some of the 11 states plus the District of Columbia that run their own ACA websites and marketplaces. They're in charge of their own marketing and enrollment assistance programs, so are somewhat immune from Trump administration actions — and inaction — that critics have warned will undermine 2018 individual market enrollment. "We're in a very different position than the federal government," says Allison O'Toole, who runs Minnesota's exchange, MNsure. "I see a lot of action coming out of Washington designed to destabilize the market and to hinder enrollment. I have the exact opposite goal in Minnesota." A recent analysis by the chief marketing officer of HealthCare.gov under President Obama estimates that the marketing cuts alone may reduce next year's enrollment by at least 1.1 million people. In contrast, MNsure is planning another all-out annual enrollment push with TV ads and on social media. It will also pay other organizations to help spread the word; for example, MNSure gave $500,000 to Portico Healthnet, a nonprofit health care navigator group, for outreach efforts. "Portico Healthnet was able to staff up — so we have more navigators on staff now to prepare ourselves to meet the needs of the open enrollment demand," says Meghan Kimmel, president of the organization, which is based in St. Paul. "We are anywhere we can be where we can talk with people about access to coverage." 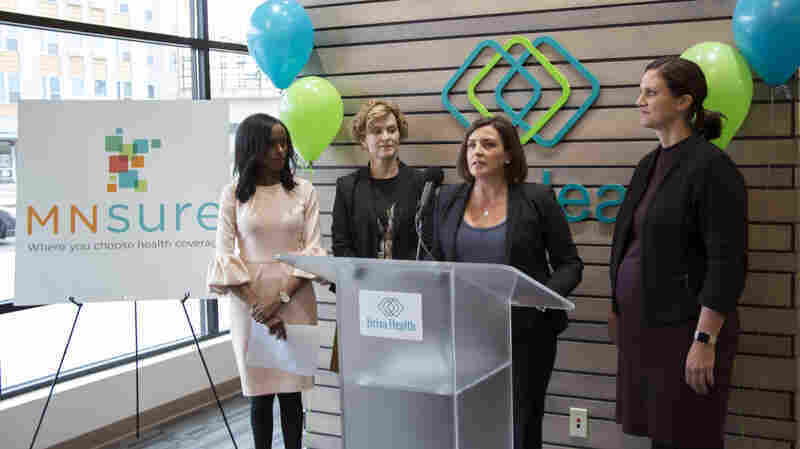 Minnesota's Human Services Commissioner Emily Piper, right, and Minneapolis Mayor Betsy Hodges, second from left, joined MNsure CEO Allison O'Toole, and Hodan Guled, left, at a recent enrollment launch event in Minneapolis. The picture is very different in states like Mississippi, which relies on HealthCare.gov, the federal exchange. Open enrollment in these states is shaping up to be much different under President Trump than it was under President Obama. "We're still enrolling," says Ginni Tran, who works as an ACA navigator at Mercy Housing & Human Development in Gulfport, Miss., "but we're not aggressively outreaching and educating" because there isn't enough money. Tran's office helps Gulf Coast seafood industry workers find health plans on HealthCare.gov. Cuts to federal enrollment assistance translated to a 70 percent smaller budget for Mercy's open enrollment activities. Mississippi's uninsured rate has fallen to 12 percent, but remains tied for third worst in the United States. Gov. Phil Bryant has staunchly opposed the Affordable Care Act and did not expand Medicaid. Kimmel and others says what's happening in states using HealthCare.gov underscores the value of Minnesota having its own exchange. At least one longtime MNsure critic, however, remains unpersuaded. State Rep. Greg Davids, a Republican, dismissed the notion that cutting back on the open enrollment period and slashing the promotional budget will discourage enrollment. He favors having the state turn to HealthCare.gov, instead. "We need to get rid of MNsure," Davids says. "They're an unnecessary duplicate layer of government that hasn't worked."